It's almost over. 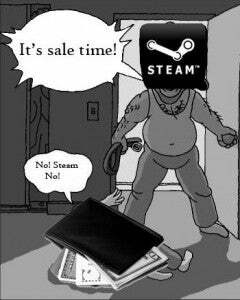 The Steam Summer Sale comes to a close tomorrow and your wallet can breathe a sigh of relief. Share what you picked up. What's been your favorite purchase so far? I had a $30 gift card that I'd been looking to use on something. So I decided to use that to budget myself instead of having to deal with a credit card/paypal. I'd been looking mainly at co-op stuff for when I have to visit home soon. I picked up Risk of Rain early on for $2.50 and was really surprised that it had slipped under my radar for so long. It's tough to pull myself away from it and I've yet to try the online co-op. If you don't have it, I highly recommend picking it up while it's still on sale. Heck, I wouldn't experience any buyer's remorse even if I had to pay full price for it. I'd also recommend Dishonored for 5 bucks and Payday 2 for $6 is a steal. Anyways, I bought Grid 2 afterwards to cure the occasional racing itch and I finally caved and got Broforce and Borderlands 2 GOTY after eyeing them for a few months. Spacebase DF-9 on sale for $8.50 was really tempting since it reminds me of Theme Hospital except with a sci-fi setting, but after seeing some of the user reviews about the game I decided to hold off for now. Either way, I'm really satisfied with what I picked up.